How many photos do you have of your first few months of life? As a child of the eighties and pre the digital era, there are naturally a lot less photos of my early life than there would be today, but I have to say I would really LOVE there to have been more of them. My eye is drawn to the background details: the room I was in, the mug on the table, the fonts on the magazines, the clothes my parents were wearing - it’s ALL about the details for me, and each photo is a treasure trove of context to a bygone time. But I completely understand that the last thing my parents probably felt like doing on the regular was getting the camera out with a newborn baby to handle - especially since having two babies of my own! The sleep deprivation can mean that everything non-essential goes out of the window! BUT, whenever friends of mine have babies now, I do love to take a few photos of the early days, and I really recommend you doing the same for yours - it’s a time that flashes by in such a blur and having a gateway back to it is such a gift! The simple fact is that Mums need to be in more photos, for themselves, for their children, so if you’re spending time with any Mums today, take a photo of them with their baby (however old that baby is!) - they will thank you for it! This morning I’m looking back on a lovely in home newborn session I did back in December, which was such a joyful and happy morning! 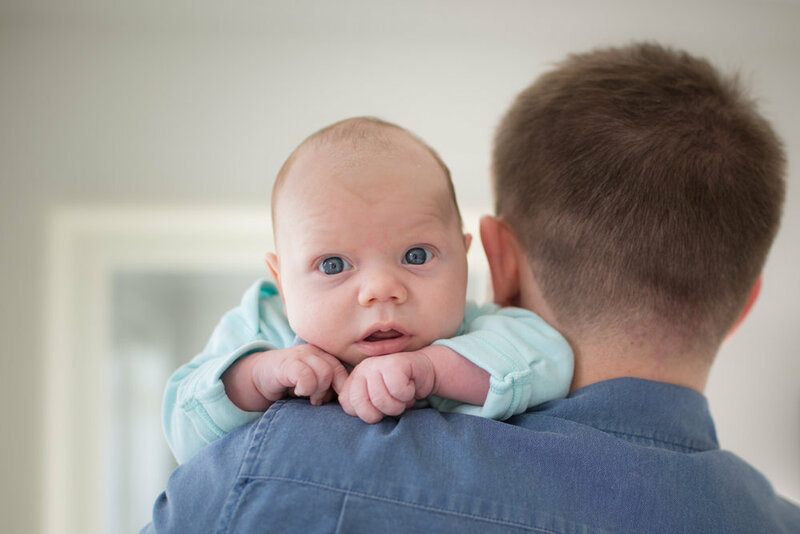 Nothing brings a more magical atmosphere to a home than a new baby, and capturing the early days for parents is something I know I’m so lucky to do. One of my favourite things about being able to photograph new arrivals in the family home is that it allows us to capture details of baby’s first home and record elements of the early days of parenthood which I know will be so fondly looked back on in years to come. This was a lovely light and bright home, which meant that we were able to shoot pretty much wherever we wanted in the house before heading out for a walk in the woods. My newborn sessions are very relaxed and unposed - the focus of the session is to record some lovely and real moments of the early days and of a new family all being together, and that’s exactly what we did. Congratulations to this gorgeous couple, I can’t wait to see you again soon!